Londoner’s can breathe a collective sigh of relief; winter is officially over. Shaking off one of the coldest and longest winters known to mankind (or to us at least); the city has been released from the icy clutches of doom - finally! All woeful tales of newborn lambs hidden beneath lashings of snow and an absentee springtime have been forgotten. Summer is just around the corner and everything seems happier, lighter and, well, a bit darn brighter. This trendy East End bar and grill is the ideal place to catch some summer rays. Nestled in a converted Victorian warehouse that oozes rustic appeal, exposed brickwork and 100-year-old olive trees add an element of charm to the already chic Shoreditch spot. Perched beneath a weatherproof pergola and a canopy of grape-producing vines, the wine and dining area provided is both warm and inviting. Here, by a wood-burning fire, visitors can watch the sun go down whilst admiring the sprawling cityscape below. How to get there: Running parallel to Shoreditch High Street, Boundary is found on the corner of Redchurch and Boundary Street. The nearest tube is Shoreditch High Street (150 yards) or Old Street station (approx. a 5 minute walk). Opening Hours: 10am to 11pm, daily. Overlooking the towering dome of St Paul’s Cathedral, Madison is a popular hangout for inner city slickers. A restaurant, tapas and cocktail bar all rolled-into-one, the exclusive vantage point of this rooftop spot make it one the best places to spend a warm summer’s eve. Plus, with delicious offerings on the menu from sharable charcuterie boards to dry aged steaks, complemented by an eyeful of London’s bustling city core, you can hardly go wrong. 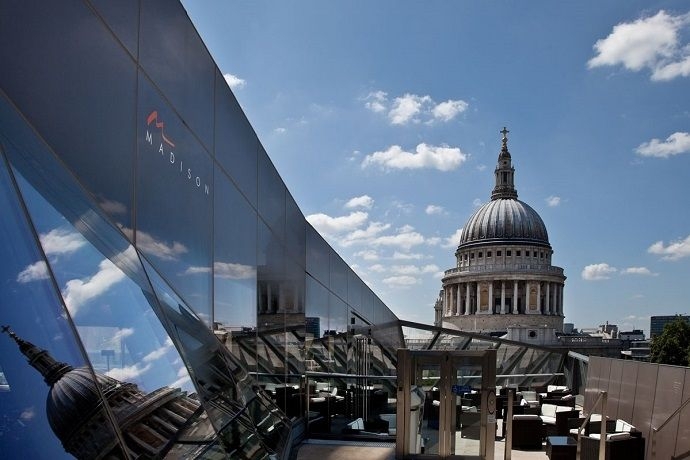 How to get there: Madison is located on the rooftop terrace of the One New Change shopping centre. The nearest tube station is St. Paul’s. 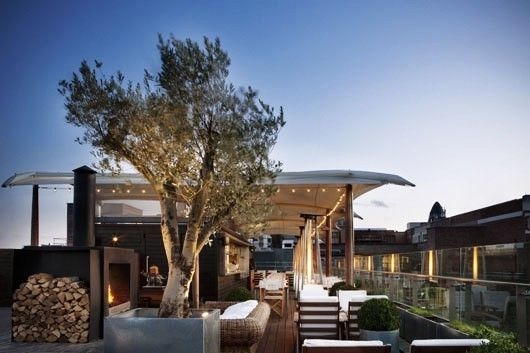 A leafy oasis residing on top of a city-centre location might seem like an unattainable feat for some but, for the Kensington Roof Gardens impracticality is never called into question. One and a half acres of flourishing foliage and tranquil gardens populated by fully-grown oak trees, seasonal flora and a flowing stream, the setting of this high-rise spot is unmatched in London. Stop by the Spanish Garden to marvel at the accents of Moorish architecture, wander through the Tudor Garden to breathe in the delicate scents of lilies, roses and lavenders, or, amble through the English Woodland to meet four of the resident flamingos. And, if you are feeling really decadent after all of this, then dine at the exclusive Babylon Restaurant where you can gaze at panoramic views across London. 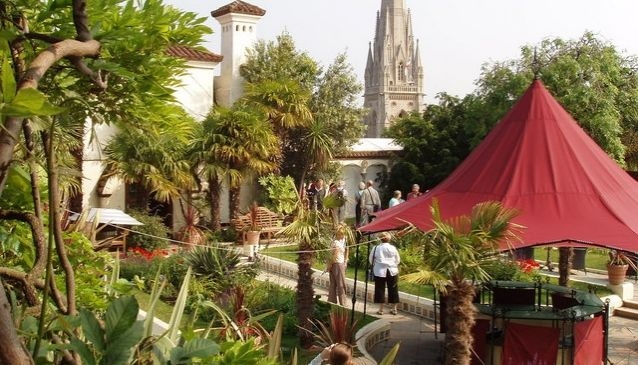 How to get there: The Roof Gardens are accessed by Derry Street though a doorway marked ’99 Kensington High Street’. The nearest tube station is High Street Kensington. 7pm – 10.30pm, Monday to Saturday. The antithesis of Shoreditch House which operates a strict member’s only policy just around the corner, this fun-loving bar opens its doors to everyone. 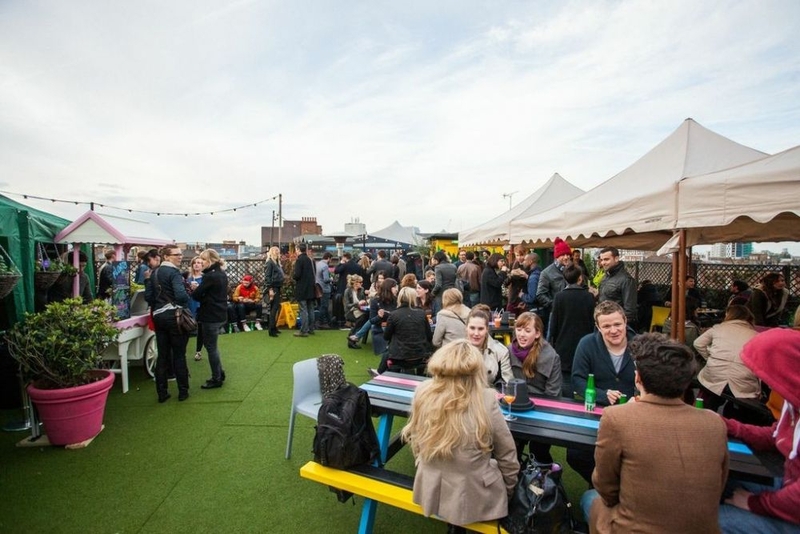 Inviting guests to spend summertime upon its tranquil rooftop decking, the Queen of Hoxton shakes off the winter freeze by swapping cozy wigwams and warming fires in favour of garden furniture and twinkling fairy lights. With a consistent stream of ever-changing events including barbeques and silent discos plus a regular rooftop film club, this enterprising bar has thought of it all. How to get there: Queen of Hoxton is found on Curtain Road, just a short walk away from Shoreditch High Street tube. 5pm – 2am, Thursday to Saturday. 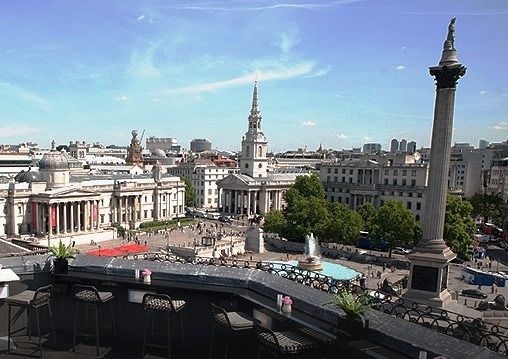 Peering over The Trafalgar Hotel, Vista is one of our most exclusive rooftop spots. A swanky place to stop by after work to sip on a glass of bubbly, Vista is our go-to terrace for a touch of sophistication. Emulating the 50s Mod style, flashes of black and white patio furniture are accented by highlights of neon pink scatter cushions, adding a lustrous glow to an already chic setting. The overriding asset of this bar, however, is of course the view. Here, Nelson’s Column pierces the skyline to your left, The London Eye faces you straight ahead, and Big Ben is just around the corner. While the drinks menu comes with a lofty price tag to match, the view makes this added splurge all worthwhile. How to get there: Vista is located on the sixth floor of The Trafalgar Hotel, on the south side of Trafalgar Square. The nearest tube station is Charing Cross. *Please Note: This bar charges a £5 cover charge for entry after 4pm. Also make sure to call ahead before you turn up, bookings are required here.